Our family is jumping on the plant-based bandwagon and have been slowly, very slowly trying to integrate more vegetarian and vegan inspired recipes into our diets. We started reading this book and it has really opened our eyes. It is extremely educational has been the catalyst for us being smarter about what we put into our bodies. For us, removing meat from our diet has been fairly easy for the most part but cutting out eggs and cheese has been more of a challenge. Cheese, well because it’s cheese. I mean, I love cheese! And eggs, mainly due to the fact that we haven’t found an egg substitute that we really enjoy just yet. If you have some suggestions please comment below! For the past few months we have been experimenting with plant-based meals. Some have been duds and others, like these tacos, have been a HUGE hit in our house. Even my kids are enjoying these lentil tacos! They are a bit heavy so we try to keep them for more of a Friday night or weekend meal. Do you have any great vegan recipes? Send me an email or comment below. I’d love to hear about them! Preheat oven to 425 degrees. Toss cauliflower florets with enough olive oil to cover them in a light, even layer of oil. Season with salt and pepper and arrange the florets in a single layer on a baking sheet. Roast for 30 to 35 minutes, tossing halfway, until the florets are golden. 2. Heat the olive oil in a medium-sized pot over medium heat. Sauté the onion and garlic with a pinch of salt until the onions are softened and turning translucent. (about 5 minutes) Add the tomato paste, cumin and chili powder and sauté for another minute, and stir. Add the lentils and the vegetable broth. Raise heat and bring the mixture to a light simmer. Cook, uncovered, for 20 minutes to 45 minutes, until the lentils are tender and cooked through. Make sure you don’t overcook! Lentils can get very mushy when cooked for too long. Reduce heat as needed to maintain a simmer, and add more broth as needed, if the liquid evaporates before the lentils are done. 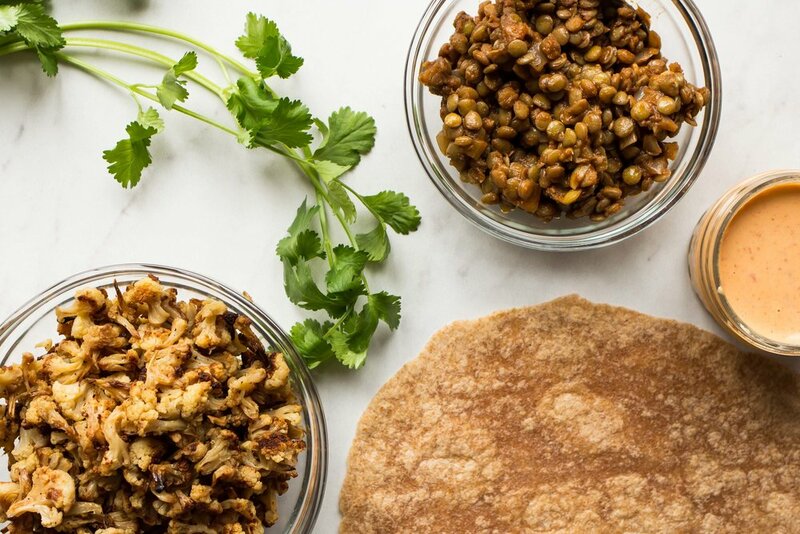 Once the lentils are done cooking, drain off any excess liquid, cover and set aside. 3. For the chipotle sauce, whisk together the ingredients and set aside. If you’re using whole chipotle peppers, make sure to puree them first then combine with other ingredients. 4. Serve with tortilla shells either warm or cold. Both are delicious! 5. 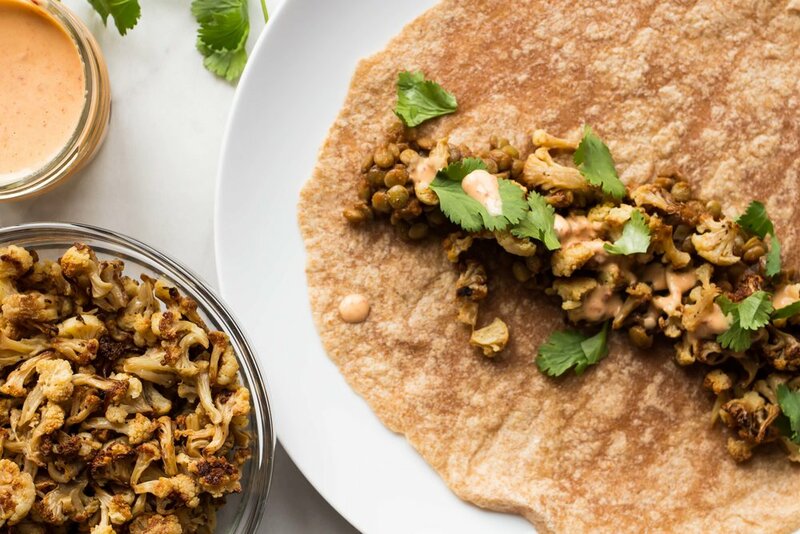 To create your taco, start with the lentil mixture as your base, then add cauliflower, a drizzle of chipotle sauce and top with chopped cilantro. Enjoy!